This exceptional home was originally built in 1903 for Norwegian immigrant N.J. Moldstad, a prominent Mount Vernon businessman. He owned a clothing mercantile, was a state legislature representative, and president of the town’s First National Bank. The house remained there over 60 years. Until that time, it had been occupied continuously by members of the Moldstad family. The 4,000-square-foot structure was located on the corner of Cleveland and Broadway Streets, the site of today’s Red Apple Market parking lot. In 1965 it was purchased by Richard and Pat Smith who had it barged down the Skagit River several miles south of town to its present location on Dike Road. It is said that the workmen had to formally agree “not to spit tobacco on the floors” as a condition of their employment. The Smiths paid $1 for the house, $6,000 to move it, and another $1,801 for the foundation. The new site was formerly the circa 1900 Bevis family farm, before that farmhouse burned down in 1962. Much of the home’s grand aura of the early 20th century is still in evidence. It features a welcoming veranda and leaded glass windows as you enter the front door. The lower floor originally included a dining room, a fine library with claw-footed bookcases that traveled to Mount Vernon on a ship around Cape Horn, a parlor, two kitchens; (one for the family, one for the servants) and a butler’s pantry. Under the carpets, the original fir floors remain. In the dining room, the present owners say that there used to be hidden buzzer in the floor under the dining table that could be pressed to discreetly summon the servants. 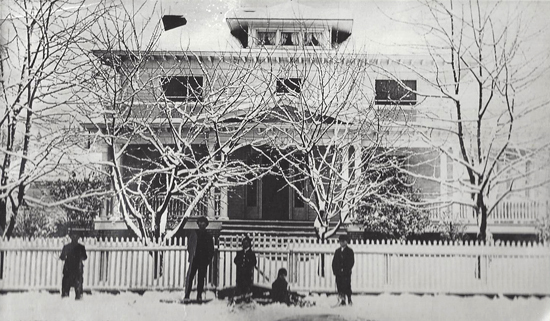 Two flights of stairs lead upstairs to five bedrooms and a bathroom, and one more flight led up to the third floor to the attic and maid’s quarters. You can even step through French doors onto the second-floor porch. A central heat plant furnished hot water. The present owners are the Smith’s grandson and his wife, Jeff and Jessie Anderson. The 6-acre parcel is also now used as a wedding venue under the name “Maplehurst Farm,” named for the numerous maples that line the long driveway. A building that once stored machinery is now a 5,000-square-foot event facility with bride’s dressing room, kitchen and food preparation area, bathroom, and dining/dancing area. Ceremonies are held on the spacious landscaped lawn under a trellis with the farmland and Mt. Baker in the back-ground.